Wow, this was a lot of work. I have really come to learn that every project is going to take twice as long as you think and cost you twice as much money. This project seemed to follow that truth to a T, and then some. 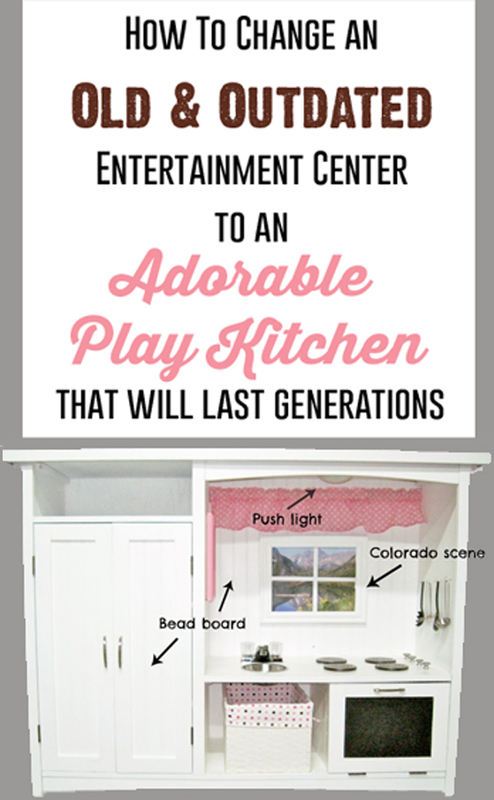 Over a year ago I came across this adorable play kitchen from giggleberry creations found here. I pinned it to my "Things to do if I ever feel creative" board on Pinterest (the board where most projects go to die since I use that board for the things that are awesome but look out of my comfort level), and thought that if I had a girl that I would make it. ...for free on Craigslist, only 20 minutes from my house, (in my dream neighborhood of the Pinery), I knew it had to be mine. I loaded up my two littlest boys since the others were at school, and we drove over there thinking that I had enough room in my stow n go van to load this, and still keep the boys safely seated in their carseats. When I got there the owner of this beautiful piece of outdated furniture helped me load it into the VERY VERY tight space still available in my trusty van, and I thanked him profusely and drove happily home. Lightly sand using around 150-220 grit depending on the project. Sand with the grain. This will help the stain or paint adhere to the surface. Clean off all dust and grime. Prime and paint. There are lots of good articles as to when to prime and when not to, but here is a good site to check out if you are confused like I was. Also, I would not do this project without my handy dandy Wagner paint sprayer because this part took forever and if I were hand painting I think I might have killed myself. Plus, let's be honest, seeing brushstrokes is enough to make a person mad. If you chose the spray paint route you would go through a TON of aerosol spray paint cans (and a lot of money). With the Wagner you buy good latex paint, barely water it down, and turn it on. 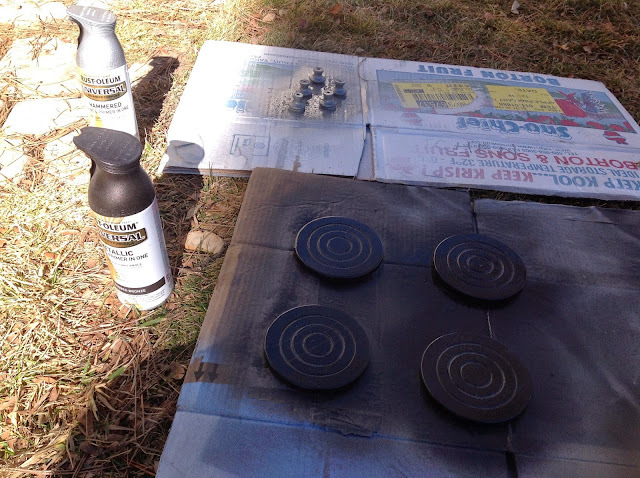 Works just as well as any Rustoleum spray paint and looks professional. 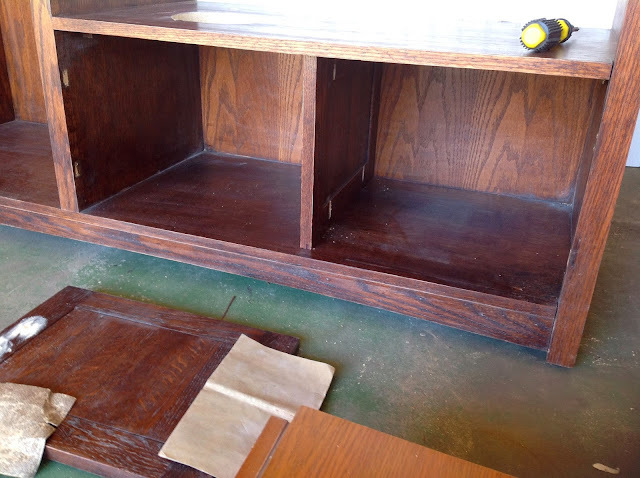 Here is everything dismantled, the bead board put on the back, as well as the doors. 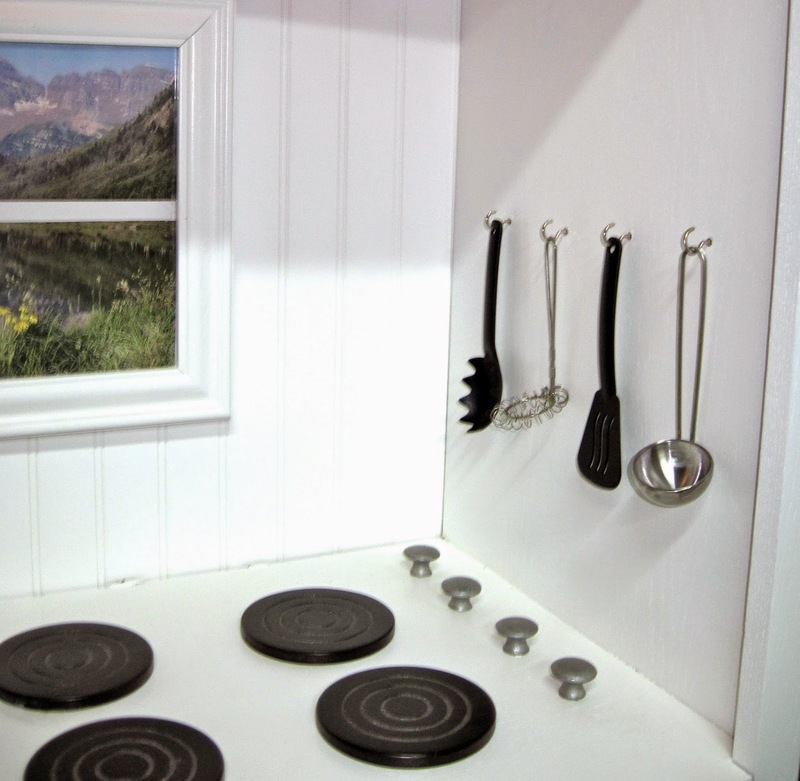 I used Rustoleum's spray paint that I already had on hand for the stove pieces and the knobs. I wish I took before pictures of these...they are just made of wood. I got the stove pieces, which were wood coasters at Goodwill for 50% off. The wooden knobs were from an old dresser that got new hardware, and were spray painted to look like they are made of nickel instead. 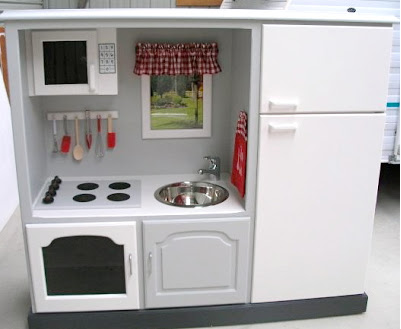 I wanted an enclosed oven, rather than a big open space that had two cupboard doors. 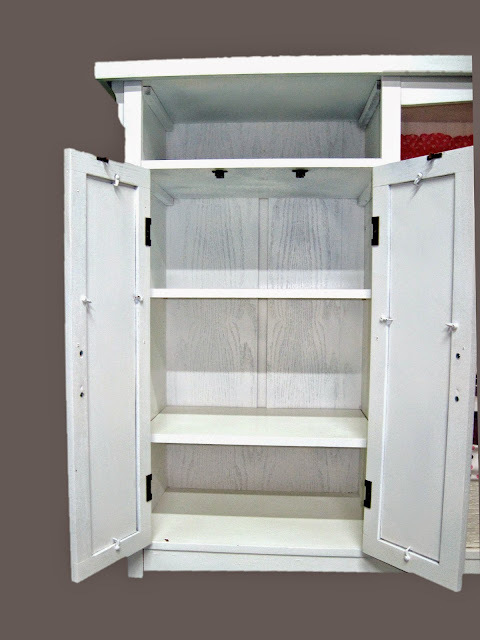 I took one of the cupboard doors and used my kreg jig to create pocket holes to screw the door in as a divider. Those are some of the strongest joints you will ever know, super easy to do using the K5, and the screws are hidden within the wood. Love it. After all of these steps I painted. When all was painted it was time to get all of the accessories ready. The above picture is an indicator as to how this step of the process went. Every single thing seemed to run into a roadblock and take me 3x as long as I expected. Here are some of my headaches. You will have plenty of your own if you do this too :). 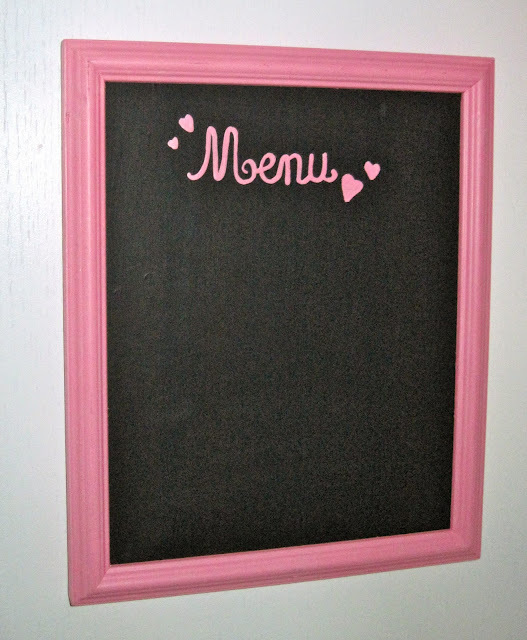 Painted a smaller frame to use as the window, but then it looked too small so decided to make that into a chalkboard menu and found a bigger frame that we already have. Painted that. Then broke the glass that went into it. Dang it. Had to re-think what to use. Neighbor gave me a creative idea for the broken window, and now the window is much more safe...no longer glass. Oven door had the hinges changed from being on the side to being on the bottom so that it could open the way an oven should. With this change though, the door no longer closed...it was now too high. So had to un-screw the hardware and take the door to a table saw and saw off 1/2". Re-sand, re-paint. Re-do hardware. I used chalkboard paint for the oven door front as well as the Menu. These were successful, but taping and then painting several coats always takes longer than I want to take. The knobs wouldn't turn like I wanted them to, so I took them all off, sanded down the bottoms of them hoping that would now make the screws holding them down too long and thus the knobs would freely turn. 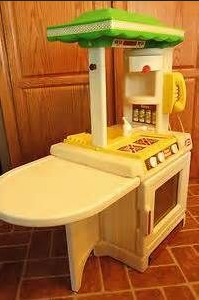 In the end that still didn't work, and I figure, this kitchen is for IMAGINATIVE play, let them use their imaginations that these turn :). There are a million other things that needed to be done numerous times, but why bore you with that. The lesson I am passing on to all of you is expect things not to go as perfectly as you think. It is super frustrating and many times I wanted to throw my screwdriver because I couldn't get the screws in the right places, or things just weren't going my way, but it all worked out. And hopefully only I will notice the imperfections in the end. 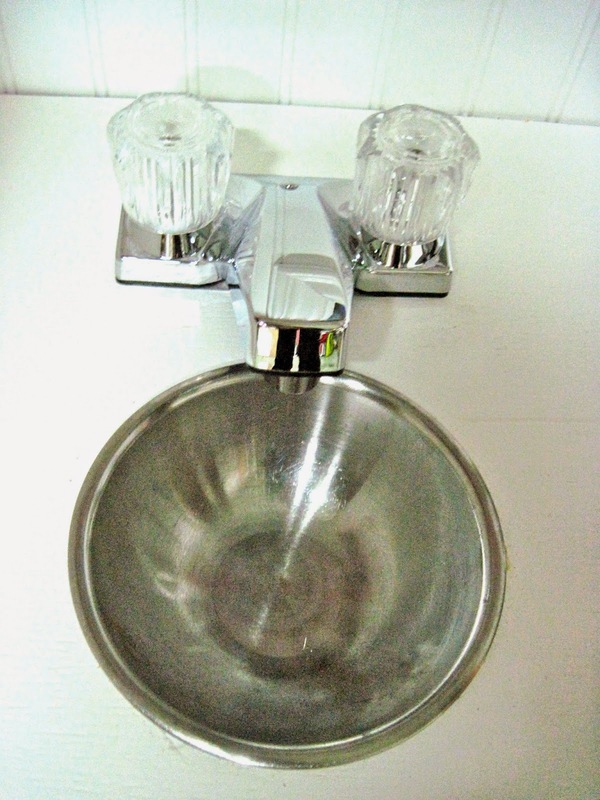 I got the faucet for the sink from Home Depot. They have a simple faucet with your hot and cold knobs for $14. I wanted to find one for $5, but Goodwill didn't have any. The manager at Home Depot, who showed this set to me, gave it to me for 50% off since the box looked like it had been opened and might be missing something crucial if you were indeed planning on using this for a real sink. Since it was for pretend I didn't care, and for $7 for a brand new piece...SCORE! 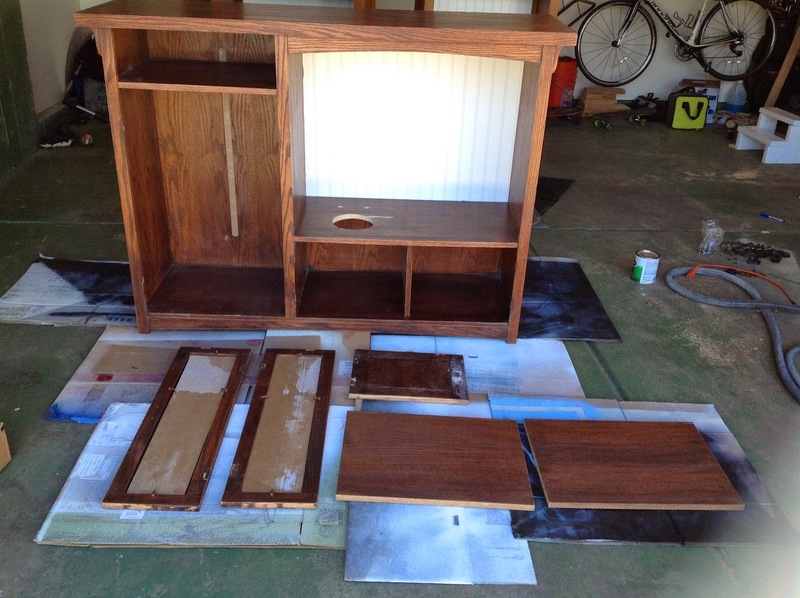 For the stove pieces and bowl/sink, I used Gorrilla glue to adhere them. That stuff is STRONG! Wowsers. Follow the instructions and you will never be able to move these things again. Trust me I found out the hard way. One of my stove plates moved South while drying (long boring story), and so I had to use a chisel and hammer and remove it to re-glue it. Annoying. But proof that Gorilla glue is as good as it claims to be. My wonderful mother in law made the valance. I bought the fabric and was going to use my gorilla glue to make it look like it was sewn, but she said to let her make it with her sewing machine...probably a better decision. We just put it on a simple piece of wood we already had, and then screwed in screws from behind the unit, into the ends of the wood piece. I loved another crafter's idea to use a push light from the Dollar Tree. I put velcro on the bottom of it so that it can be taken down to replace batteries, and then hooked it on to the "ceiling" for an added fun feature. The piece is on coasters. For some reason I love this. I got it this way and it is so easy to move when on a smooth surface. They can easily be removed by the future owner though, if they don't want the kitchen to move around. The oven shelf is using an old cooling rack we had. I used my Dremel and cut off one row so that it would fit, and then screwed in two screws both sides for the rack to sit on, and then a screw on each side right above the rack so that kids can't take it out (for safety reasons as well as they won't lose it). 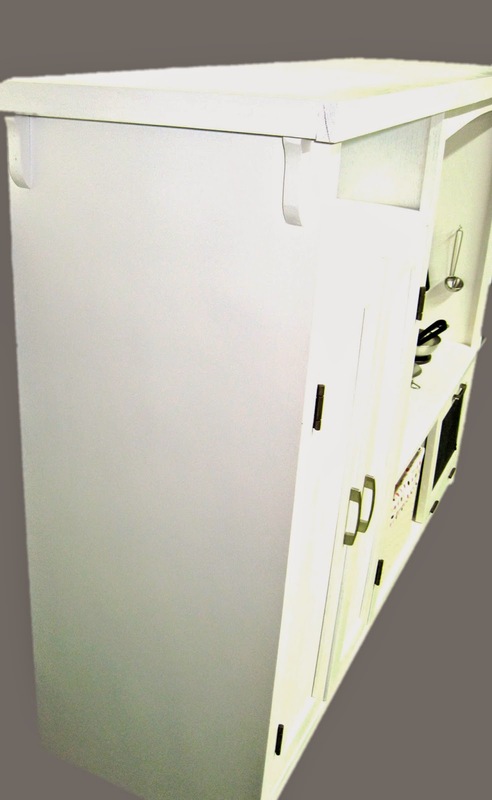 Close up of beadboard within the fridge doors. The lighting wasn't great, but these are truly white. 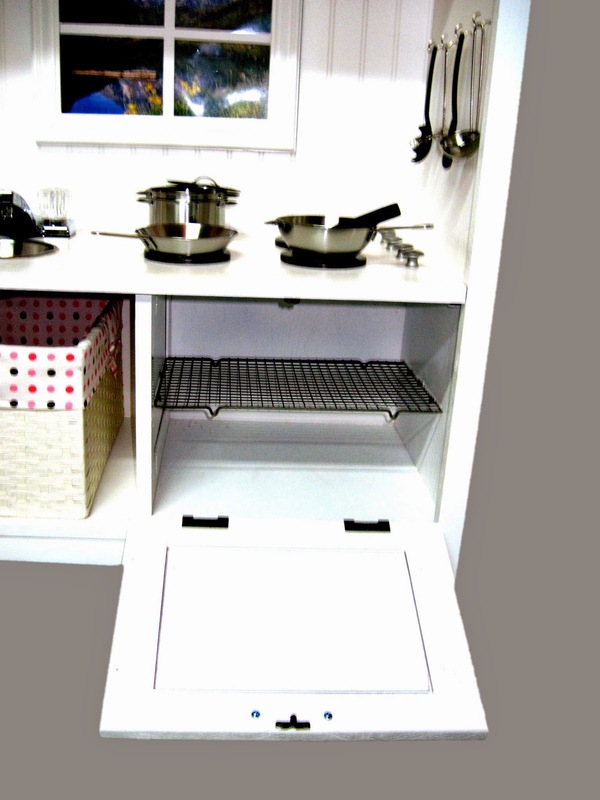 Added hooks so that cooking utensils can be displayed and easily accessible. 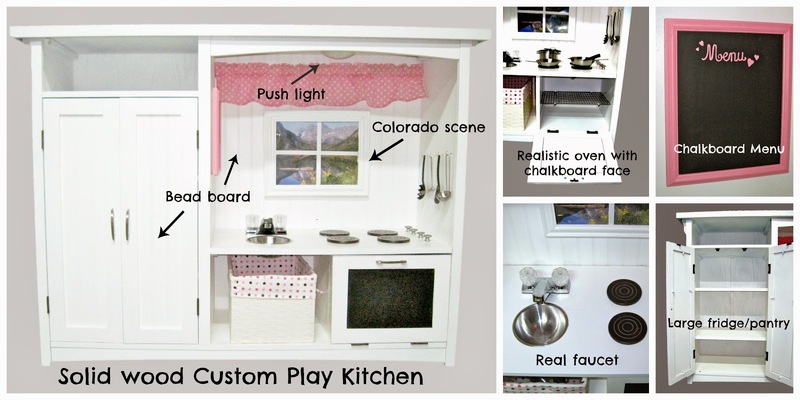 Thanks Ikea for making adorable play sets. Ad I made on Picmonkey for Facebook pages that don't like items to have a lot of pictures. So many hours later it is done and being posted for sale. Pottery Barn sells this for $480 when all is said and done. On etsy, other conversions like mine (which are not nearly as awesome ;) ) go for $500 (and that isn't including shipping and tax...yowsers). Considering how much time it took, how solid and one of a kind this piece is, I am going to price it at $400 and hope a super awesome grandma who has that kind of money to spend on her grandkids, wants it and will get a lot of use with it. Or maybe there is a mom out there who can spend that for fun things for her kids. I am one that has to get things cheap and then put in hours and hours of my time to get things for my kids, but we all have it differently and that is what makes like great right?! I figure Power Wheels are in this price range and there are a ton of those toys cruising down sidewalks everywhere, so hopefully I am not being crazy. We will see. I will keep you posted. 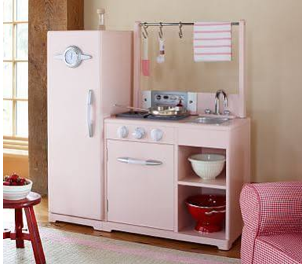 2/24/2015 Update: My lovely friend bought this kitchen for her two daughters for a little less than I was asking. 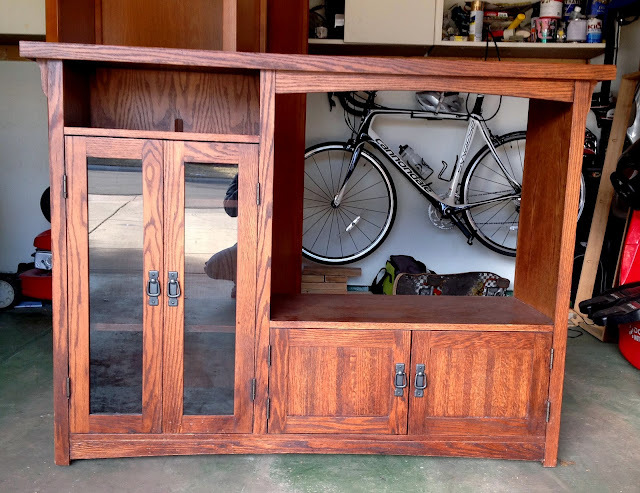 I had a request to update some furniture for a client and needed the garage space so I lowered the price and she (and a few others) jumped on it. I am happy it went to a great home and will get a lot of fun and use out of it. Heck, it will probably be in good shape for when she has grandkids too! Spray Paint: $3-5 can. I used Rustoleum's rubbed bronze and hammered nickle? (not sure which one it was I used for the knobs). I already had these so no cost to me. 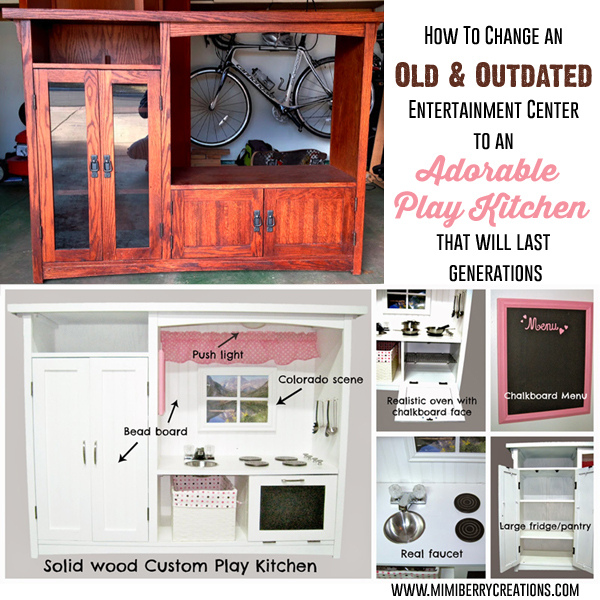 So does transforming an outdated entertainment center scare or excite you? Have you ever transformed one? If so, what did you do? I'd love to hear any and all comments. Hi! I have a question about how you did the fridge doors. 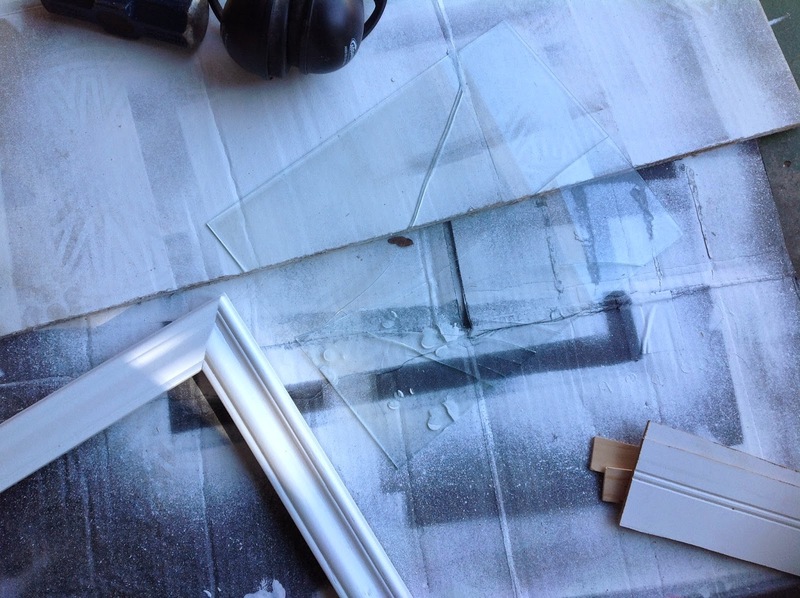 I am doing this same project and my door has glass in it as well. How did you remove it? Did you just break it and it fell out and then how did you add the beadboard in its place? Great question Madison. 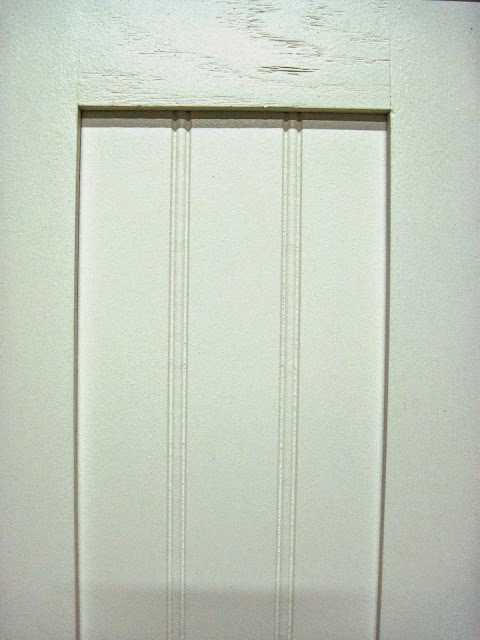 If you look at the picture where the doors are opened and now holding the bead board, you'll see four little peg like brackets per door. They are held in by screws, which once the screws were removed the glass comes right out. I've never seen one with the glass permanently held in, but if you have one like that I guess breaking it is your best option! Best of luck in your transformation!